We didn’t go for the traditional battered fish and chips, but instead opted for the grilled cod with parsley sauce (£16). 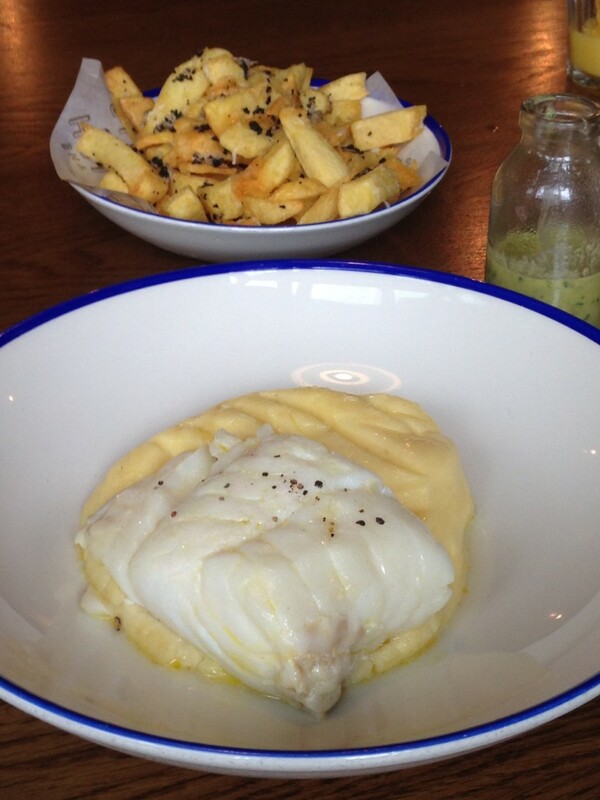 The cod flaked nicely and was moist and flavoursome. The parsley sauce, made using a fish veloute, a touch of cream and lots of freshly chopped parsley was lovely and fragrant. At the base of the dish was a glorious mashed potato. The potato had been passed twice and then mixed with a generous amount of butter. It was really delicious and additively buttery and smooth. 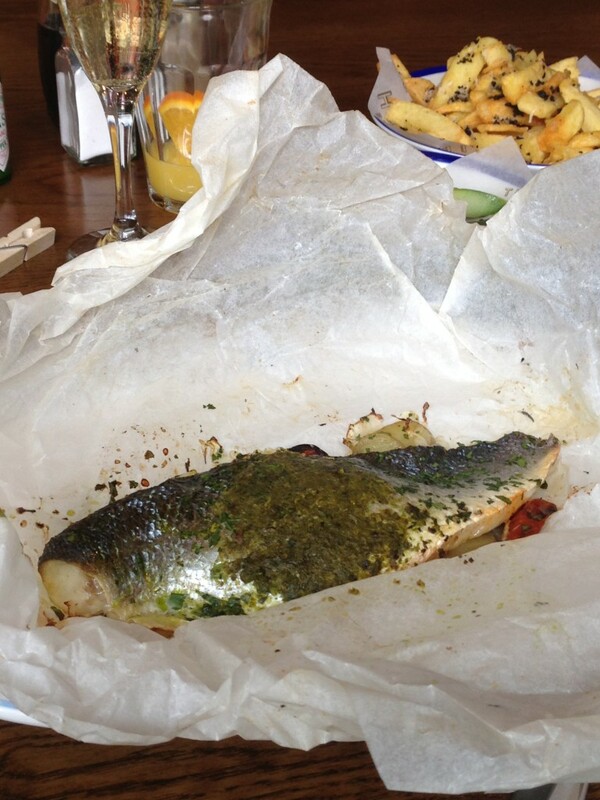 Paper baked bass (£15) had been baked with tomatoes, lemon and a coating of parsley and oregano. The fish was tasty and the herbs added a fragrant and lively quality to the fish. The dish was a little dry however, and a slightly shorter cooking time might have served to avoid this. 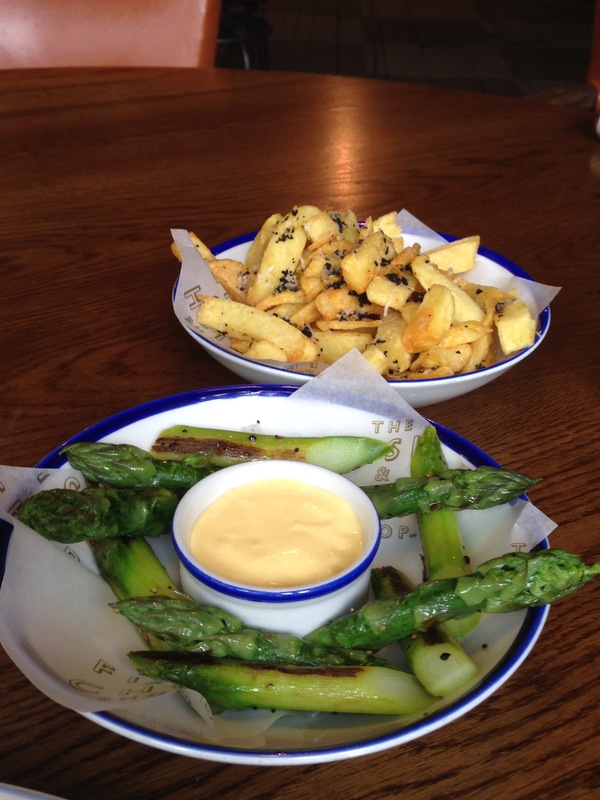 We adored the sides, particularly the truffle salt chips (£4.50). These were crunchy on the outside and fluffy on the inside, with its flavour being further enhanced by the aromatic truffle shavings. 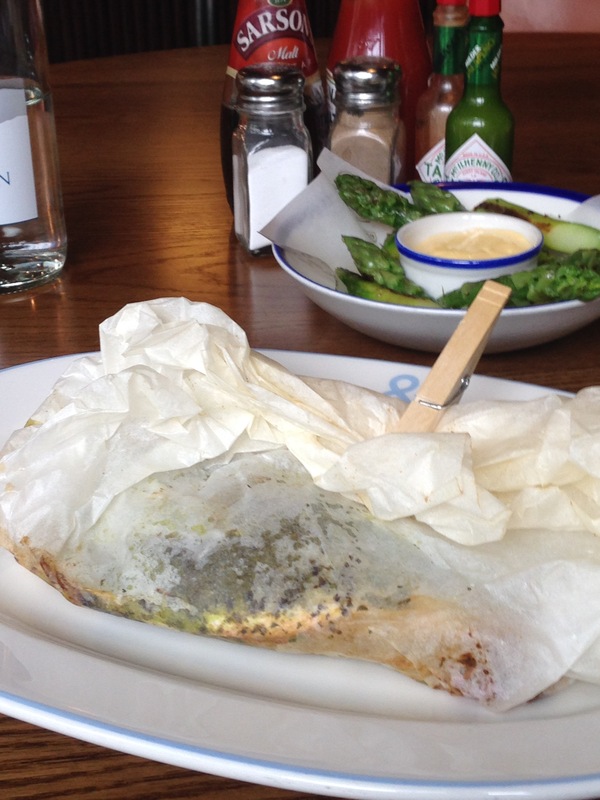 The seasonal asparagus (a starter which we chose to have as a side) was well cooked with a slight crunchiness. Accompanying the asparagus was a tasty hollandaise sauce with just the right amount of tanginess. 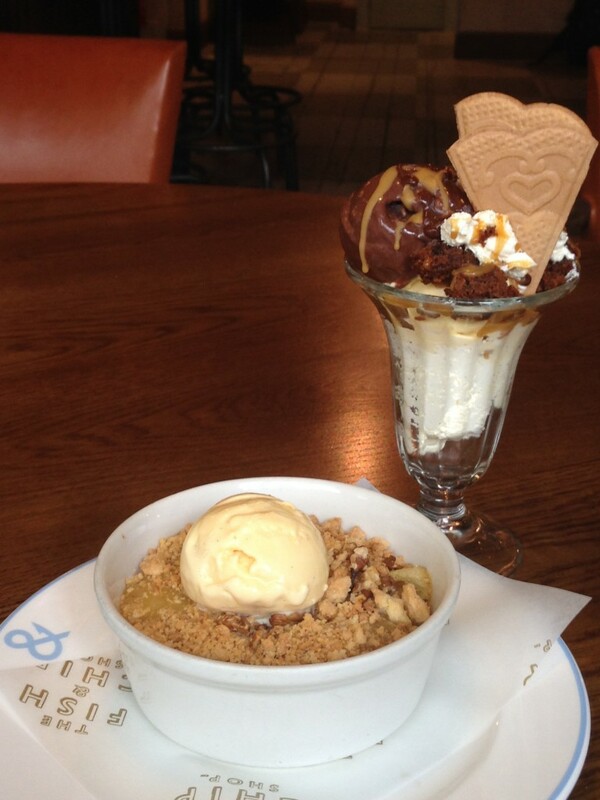 Desserts of chocolate and toffee sundae (£5.50) and apple and walnut crumble (£5.50) were both pleasant on the palate. The sundae was generously filled with ice cream and a lovely toffee sauce, but I would have preferred some crunchiness, eg nuts, for an added texture. The crumble as a whole was warm and soothing and well balanced between sweetness and acidity, although the apple filling was a little too mushy. The walnuts were a nice addition to the crumble. The food at The Fish & Chips Shop by Des McDonald was to be applauded. 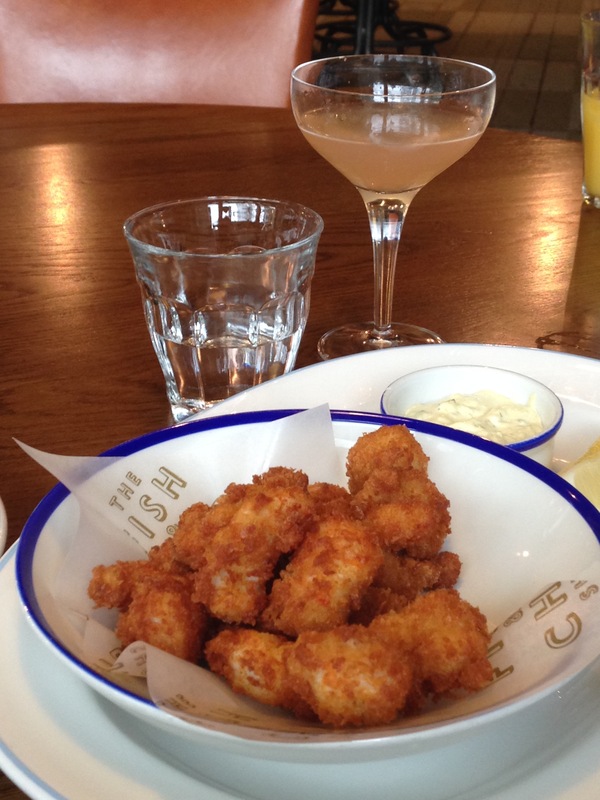 The menu was simply and unfussy, and yet wonderfully delicious, with each element being cooked with care and attention. When you have a wonderfully cooked piece of fish accompanied by a tasty parsley sauce and a fabulous mashed potato coming together and tasting great, it just shows that uncomplicated food can still be delicious. The service was relaxed, yet professional. The Fish and Chips Shop is a great little outfit. 1) The cod dish, especially with the fabulous mashed potatoes. 1) The desserts were perhaps the weakest link. Prices: £26 to £39 for three courses and a side, excludes drinks and service.